ab28512 recognises Transcription factor AP-4 (TFAP4). Our Abpromise guarantee covers the use of ab28512 in the following tested applications. WB Use a concentration of 1.25 µg/ml. Predicted molecular weight: 39 kDa. Good results were obtained when blocked with 5% non-fat dry milk in 0.05% PBS-T. Transcription factor that activates both viral and cellular genes by binding to the symmetrical DNA sequence 5'-CAGCTG-3'. 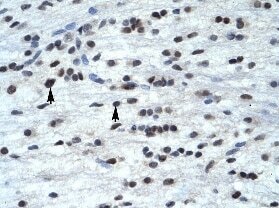 ab28512 at 4.0-8.0 ug/ml, staining TFAP4 in human brain cells (neural cells) by immunohistochmistry, paraffin embedded tissue. Cells with positive label indicated with arrows. Publishing research using ab28512? Please let us know so that we can cite the reference in this datasheet. There are currently no Customer reviews or Questions for ab28512.